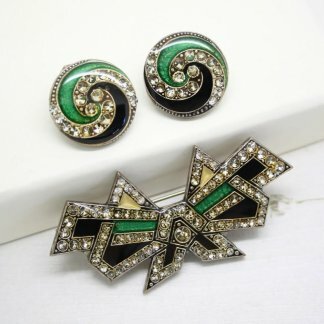 I’m happy to offer for sale this beautiful vintage brooch. This unique piece measures 6.6cm at it’s widest point. 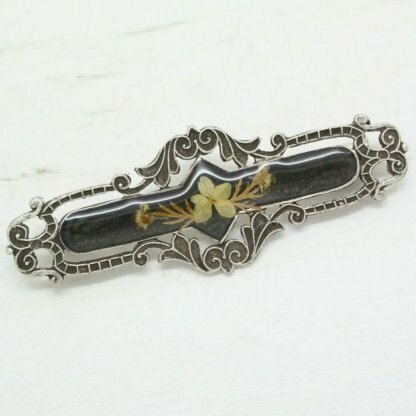 Featuring a stunning ornate detailed frame with a hand-laid dark green almost black enamel centre and real dried flowers. 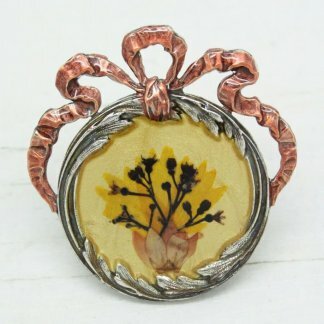 A beautiful example of Pierre Bex flower jewellery – It’s decorative design is one of the best I have found. Complete with a French barrel lock fastener, in good condition showing slight to no wear, it appears unworn. Although these pieces are later reproductions of early to mid 1900s style, they are considered vintage pieces and certainly look the part with there very high quality production, the use of the original toolings, plus the best materials give these items a great value. 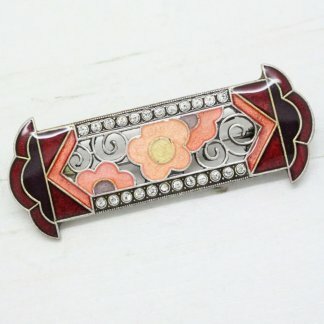 Condition: Vintage – In good condition showing slight to no wear, it appears unworn.